The crime scene in London's Russell Square is cleaned Thursday morning, following a knife attack late Wednesday in which one woman was killed and five others injured. London police have arrested a man on suspicion of murder after they say he knifed a woman to death and injured five other people in central London overnight. The woman who was killed was an American citizen, and the injured include American, Australian, Israeli and British citizens, the BBC's Russell Newlove reports. Police don't believe that the nationalities of the victims motivated the attack. Police say the initial investigation suggests mental health was a significant factor in the attack, but add that they are keeping an open mind as they investigate the motive. 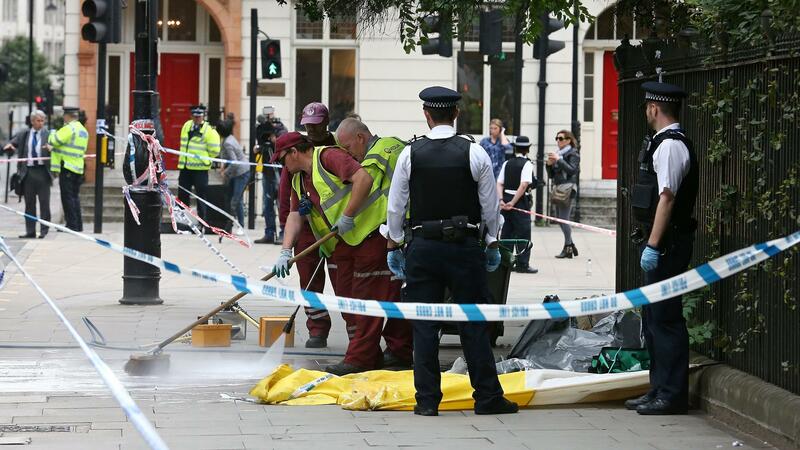 Police say the 19-year-old man went on a rampage late Wednesday night local time around Russell Square, which is a short walk from the British Museum. A number of hostels and hotels are in the area. Police subdued him with the help of a Taser and now have him in custody. Officials said more police will be on the streets today as a precautionary measure. In an initial report, police suggested they were looking at the possibility of terrorism as a motive, but they later dropped that language. The attack comes just after officials announced plans to deploy an additional 600 armed cops in London to protect against the threat of terrorist attacks. Police say an attack in London is not a matter of if, but when.